New Delhi : The Union Minister of State (IC) for Power, Coal, New & Renewable Energy and Mines, Piyush Goyal, inaugurated Blood Donation Camp organized by Ministry of Coal here today. 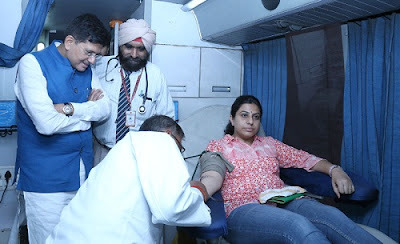 While appreciating Ministry for the camp, Goyal said that in a country like India where several people suffer due to lack of availability of blood, such initiatives help in saving thousands of life. The Minister said that I am delighted to see the enthusiasm of youth in nation building causes.